It's been little more than six weeks since France's return from their end of season tour to New Zealand and Australia but the Top 14 returns with a bang this Friday with the visit of Stade Francais to Jonny Wilkinson's Toulon. It seems somewhat fitting that the game chosen to kick off the Top 14 2009-10 season features two clubs known best for their ego-centric presidents and the accompanying whiff of cash. Max Guazzini and Mourad Boudjallel may have invested heavily in their clubs this summer but the thirty players that walk out onto the Stade Mayol pitch on Friday night will give a greater indication of what direction French rugby is going in rather than any eventual outcome to the Top 14. Elsewhere, big names like Chabal and Steyn have arrived on even bigger pay packets with the bearded one apparently earning €1m a year for his appearances at Racing Metro. Like Boudjallel, Racing president Jacky Lorenzetti has not been afraid to throw his considerable financial largesse at the transfer market but the picture becomes much more complicated once you take these two clubs out of the equation. Despite rising attendances and positive television figures, most clubs have been feeling the pinch from the current economic downtown. 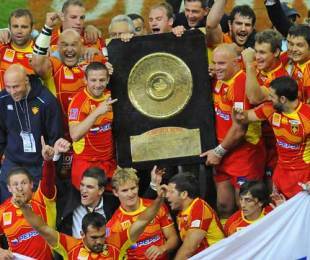 Champions Perpignan are a perfect example, announcing a half a million Euro decrease in their budget for 2009-10 despite winning the Top 14 for the first time in 54 years. According to the Ligue National de Rugby (LNR) however, Perpignan are one of the lucky few clubs along with Toulouse, Stade Francais and Clermont that are economically viable entities. The same cannot be said for the rest of the Top 14 clubs who, thanks to the wage inflation at clubs like Toulon and Racing, are now paying an average salary of €132,000 a year per player (£119,000). Encouragingly from a playing point of view, the championship has more of a balanced look to it than in recent years. Last season's Top 14 was a four-horse race from the off, and although Toulouse, Stade Francais, Clermont and champions Perpignan will once again start head and shoulders above the rest, there are reassuring signs that they will not have it all their own way. The one constant running through the French Championship since its foundation in 1892 is that it has always been notoriously difficult to secure away victories. The sight last season however, of second-string Toulouse and Clermont sides ripping Castres and Montauban apart in front of their home crowds did nothing for the Top 14's reputation. Biarritz, Brive and Toulon in particular all look a more menacing threat than they did twelve months ago while Racing Metro and Bayonne should be difficult to beat at home. The extension of the end of season playoffs to the top six clubs should liven things up also. It looks like being a long season for the rest however. Bourgoin, Montauban and Montpellier have all haemorrhaged key players this summer and will be fighting for their Top 14 survival with newly promoted minnow Albi. As ever, it's difficult to look past Toulouse. Their supporters may have become used to the club's name being bandied around every time a big-name international becomes available on the market but this summer has been all about the acquisition of three of the brightest young French prospects. Of chief interest is the capture of the France No.8 Louis Picamoles, who after a relatively quiet season for his former club Montpellier looked every bit the natural successor to Imanol Harinordoquoy on France's tour to New Zealand and Australia. Picamoles is joined in 'La Ville Rose' by Bourgoin's powerful centre Yann David while in Yoann Maestri, the young Toulonnais, Noves has signed arguably the most talented second row prospect in European rugby, and a worthy successor to the retired Fabien Pelous. Fresh from yet another heart-breaking final loss, Clermont Auvergne have recruited well. France's Morgan Parra arrives from Bourgoin to replace the Toulon-bound Pierre Mignoni at scrum half. The pack has been strengthened by the signings of Lionel Faure and Jason White from Sale Sharks. Clermont have been arguably Europe's best side for the last two seasons yet have nothing to show for it. Who would bet against them this time? Champions Perpignan have had a quieter pre-season than most, losing their pre-season matches and announcing no major signings. But in winning the Bouclier de Brennus last June, the club showed that teamwork and a pride in the jersey still means something in a league where star players are now ten-a-penny. Always difficult to beat at home, Perpignan remain an incredibly difficult side to break down and will again be there or thereabouts at the end of the season. Stade Francais are another club that have been active in the summer months with Ewen McKenzie busily signing up James Haskell, Tom Palmer, Julien Dupuy and Benjamin Kayser from Wasps and Leicester Tigers. Expect another strong challenge from the Parisiens though a lack of strength in depth at in the backline will hamper them once again. Happily for Jonny Wilkinson, Toulon look like an altogether more menacing prospect than this time last year. The capture of Philippe Saint-André from Sale was arguably Mourad Boudjallel's most important signing over the summer months but his toughest job will be attempting to get his 17 new players to gel quickly. Wilkinson's metronomic boot will be a help - the club suffered from a 42% success ratio for place-kicking last season - as will experienced signings in Sebastian Bruno, Pierre Mignoni, Felipe Contepomi and Kris Chesney. Toulon will cause a few surprises along the way but their strength in depth will be crucial as injuries pop up. Brive's pre-season can hardly have been helped by the decision of owner Daniel Derichebourg to sell his stake in the club. Last season's squad has been bolstered by new arrivals Ricky Flutey, Jamie Noon, Shaun Perry and Chiefs winger Viliame Waqaseduadua. The 1997 European Champions will be a tough draw for any team - especially at home - but like Toulon, progression into the top six will depend on keeping the squad as injury free as possible. Finally, those who have memories of the great Racing Club de France will happy to see the club back in the top flight again, albeit under the name Racing Metro. As with Toulon last season, owner Jacky Lorenzetti has been busy building a spine for his newly promoted team but doubts remain as to whether or not they can keep up with the big boys. The French second row pairing of Lionel Nallet and Sebastian Chabal will give the pack some solidity whilst Springbok Francois Steyn will bring a bit of punch. Coach Pierre Berbizier is Racing's trump card however. Expect fireworks for the first half of the season before they tail off.